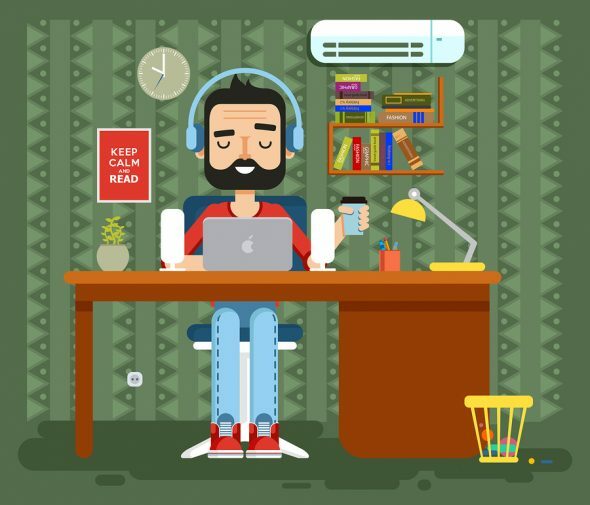 The world of freelancing and content writing is not only a very lucrative industry to be in, it’s also one of the most competitive as well. One of the best ways to compete and demand higher premiums on your writing, is to make sure you have a domain name and website of your own. This ultimately helps with allowing more clients to find your work, ranking in the search results, and also building a personal brand for yourself in the process. One of the most common obstacles in this process however, is that most writers are site designers or bloggers. The good news, is that WordPress makes this process a whole lot easier. In short, there are pretty much zero technical and design skills required to have a site of your own. This is all done through the power of WordPress, which is a free software solution that can give you the ease to create your own website with all the features of an completely custom site, but without the headaches. It is the most popular platform for blogging as well. In fact, WordPress has helped in the hosting or creation of more than 60% of the websites present on the Google search engine. In this article, today you will learn about the many benefits of using WordPress to power your site and grow your freelance writing business, while also learning more about tools, tips, and tricks for when it comes to using WordPress plugins to rank higher in the search results. As covered, WordPress makes the process of site management and content creation extremely easy. All you need to do is pick a domain name, set up your web hosting, and start using WordPress to create content for your site. If you don’t already have a website of your own, be sure to read through these VPS hosting reviews and you can learn more about the different options, rates, and hosting plans out there to choose from. If you’d like to see what’s possible through the use of WordPress, follow that link and see what a customized site with a lot of reviews and a custom theme in place looks like. FreelanceWritingGigs is also running off WordPress as well. WordPress themes and plugins will also come in handy during this process, as they are the little bits of software that are added to your sites to enhance it’s functionality. WP plugins are written in PHP and you can create your plugin in WordPress that suits your requirement. They are very important in improving Google rankings. How are WP Plugins Used to Improve Google Rankings? As important as these are, on-site SEO improvements can help as well. This is where WordPress plugins and settings come into play. Default interface of WordPress is not very user-friendly, so you need to optimize that according to your desire. Similarly, as you change the setting on your laptop and phone to make it more comfortable to use. Now here are a few tips that can improve your Google search ranking. Permalinks are the URLs of your website that are searched and referred by the users or another website to give a reference to your site. Initially, your URLs are very short in forms and they are not supposed to have any keywords that are searched most commonly on Google. But you can edit the settings of permalinks easily. You just need to be careful that your permalink contains the keyword that you want to be searched. It is the first step that can improve your Google ranking. The beginning title of your site must be attractive and comprehensive as well. The title depicts the content and moreover, it is the hook impression of your site. It must be 50-60 characters long. You can take a guide from headline analyzer to improve the impact of your title tag. Add the most searched keywords from Google to make it appear in the top sites. Give a sitemap for your website. WordPress introduces plugins called GOOGLE XML SITEMAP. This sitemap help to index the number of pages you are having on your website. This XML sitemap is very easy to use. Just by using this plugin, Google can reach the right index of your site. It can help Google to improve your site ranking. This very helpful tool in analyzing the source of your traffic, the behavior of your audience, and to examine the basic attributes. This tool is offered free by Google and moreover, this tool helps in improving and targeting your source audience. Google analytics gives a brief discussion on your traffic and their behavior’s. It can help to improve your ranking as well. All you need is to observe your strategies more carefully by getting the analysis from Google. This can help you in locating error 404 and examining the behavior of your audience. 1 – Using appropriate tags. You can add a media file to grab the attention of your readers. But before adding the media file just be careful to add at least one keyword in the image title. Images are the most important tool that helps to attract the reader but it can help you more if you use them in the right way. 2 – Proper use of HTML readings. Proper use of HTML readings can enhance the impression of your content. Yoast can give you better examples of using headings in the most appropriate way. Using H1 for the main heading then secondly, H2 for subheadings and use H3 for the subheadings of H2. Keep the headings in order to keep the content flow in order. 3 – Linking with high ranked sites. Linking to higher ranked authorities can improve your rank in the search engine. It casts a positive effect on the search engine. Outbound links are very helpful in upgrading your rank in search engine. 4 – Linking to the internal links. Well if you will provide the internal links of your pages on the top of your site then it will prevent the bounce off rate. This is just to provide ease to your targeted audience. 5 – Length of content. Most of the high ranked content is of least 1500 words. You should be careful to use the least count of 1500 words in your article. It can help your site to reach the high ranks in the search engine of Google. Most of the blogger have opposite reviews on this; they say that quality is better than quantity. Summarizing this means that short reading stuff is more attractive but the results of Google search shows that high ranked sites are contained up with least of 1500 words. 6 – Social media sharing buttons. Creating social media sharing buttons on your website can give the opportunity of sharing the relevant stuff on audience profile as well. It helps to attract traffic more. These buttons can give a fascinating look of your site as well. A neat and clean structure that employs valid and proper HTML. There is a variety of SEO plugins provided by WordPress. You can select the one for yourself. Yoast SEO, ALL-IN-ONE so, and many more are there to use. They give you ease to introduce Meta title, Meta description, Meta tags, and most searched keywords. They provide all the solution for SEO in WordPress. These plugins can help to generate an XML sitemap for your site. These plugins can help to add more functionality in your site to give it best look. These are the tools to insight the page loading speed of your site. It is considerable fact on the Google ranking. You can view the loading speed of your pages on the Google page speed insights. They provide you the ease to enhance that as well. All you need is to stay updated with your work and its progress. There are a large number of people who access the website through their mobile phones. Recent research shows that the responsive design of your site attracts more. You can view that from the browser’s viewport. If you are using WordPress then your website has the most responsive design already. While making it more responsive, just give it an overlook from your phone as well. High quality is written content. High-quality content must have a number of qualities but the most helpful one are uniqueness, shareable, informative and helpful. Google is really strict if someone steals the content of the other site, and in worse cases, a site can be completely penalized and dropped from their search rankings altogether. With this in mind, always be original in writing your own content. Use your creative skills to create unique content for your site. It’s also a good idea to quote references of any case studies or stats you are writing about, as this will help with improving the overall quality of your content as well. Google is helpful in providing you’re the concepts but it never allows copying the efforts of others. Make sure that content is unique. Then it must be informative and it must fulfill the initiative of the writing. If the audience will not find it informative then they will never search you back again. Always keep in mind that you must provide information to your targeted audience. Just keep focusing on the quality by adding more of the research work. You can also add more facts and figures that actually depict the high informative content. Now the last important fact is to make your content shareable. When a person can share your content with his friends and followers, it will give a heap to your site. It can be effective in publicity of your content even more. People can make the reference of your site in their content also. So be sure that you are facilitating the audience with the sharing options. As of 2017, 3.9 million people in the US worked from home at least half the time. Many of these people were freelancers. For someone who has always worked for someone else, the freelance network can be scary. It requires confidence, skill, and persistence to be successful. However, on the flip side — this can be one of the best and most important decisions you may ever make! If you are looking to join the remote workforce, keep reading for some useful tips that can help propel your career and earnings past the competition. You should know that confidence is not built in a vacuum. This means that trying something new and doing it well builds confidence. The more familiar you are with a thing, the more comfortable you will be with the process of it. Also think about the many other ways that businesses are looking to find and hire freelancers as well. Not only will this help with better understanding the industry, you may also learn how to better stand out from the crowd and accommodate new clients as well. Part of being a writer is isolating yourself in a blanket and coffee cocoon. You could literally go weeks without ever seeing another human being — should that be a main focus and goal of yours. Though it is recommended to make sure you break apart your day and writing/design work, so you don’t overwhelm yourself and your body in the process. When you want to start freelance networking, this is a mistake. Your comfort zone is your enemy. Start by reaching out to other freelancers and potential clients. Do this using online forums and offline meetups. Face to face meetings build real relationships and can give you new leads. Services like Meetup, Eventbrite, and Facebook regularly have public events centered around a topic. Also, platforms like Instagram are helpful for building your freelance career. Take stock of the knowledge you have accumulated thus far. Chances are you’ll find someone online in need of content around it. Do you know a lot about fitness or personal development? These are jumping off blocks for you to begin reaching out to clients. 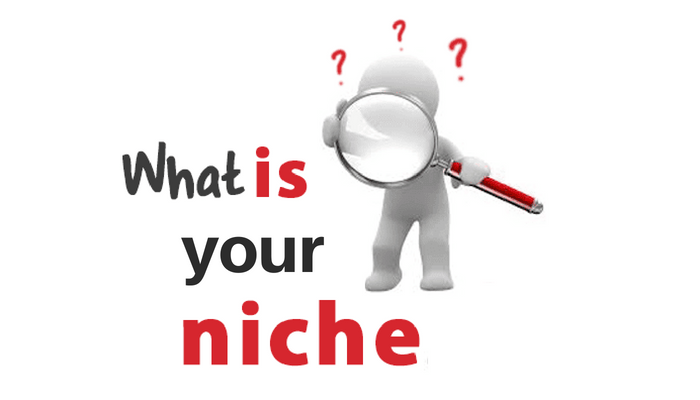 If you are unsure where to start, try picking a niche. Specializing in a few areas will help you build a portfolio of content your clients can trust. While writing is a general skill, knowledge of a nuanced subject will land you the big bucks. Choosing a popular niche will ensure that there will be ample work available. If you don’t have a deep knowledge base in a particular subject, don’t worry. It is most important to show that you can provide quality work on a deadline. The time has come to leave the research nest. Once you have an idea of what you want to write, start reaching out to people. There are many tools that can help with this process as well. Pitching is usually the hardest part for entrepreneurs. They get into a constant loop of whether or not they are really good enough. Find a sustainable number and reach out to that many people a day. If you are in a niche, write a few sample articles and submit them to websites. Make it unique with an interesting headline to catch attention. Be sure to set up an email for correspondence. Also, use a payment service so that you can send an invoice. If you are hoping to go full-time as a freelancer, build up your client base first. You don’t want to leave your current job on a hunch with no prospects. Negative self-talk is unsupportive language that keeps us paralyzed by intangible possibilities. Fear of the unknown is the major driving force behind negative self-talk. Positive self-talk can be trained and developed as you develop confidence. Psychologists and self-improvement leaders like Craig Beck assist with developing positive self-talk. Just like ‘haters’ and negative feedback can deter you from your end goal, positive feedback and self-talk can help you get to where you want to be. If you truly feel your work isn’t strong enough this is a constructive truth. It simply means you can improve your writing skills. The freelance industry, like anything new, can feel overwhelming at first — but those who stick with it and build a profitable and trusted clientele, can find great success for years to come. Like many other industries, success in it can be summed up in a few words: persistence, confidence, skill. Building your skill will build confidence. Meeting others in your field will boost creativity, leads, and confidence. From there, be persistent. Continue to reach out to clients and improve your work. Of the many different things I can teach and tell you about running a business and making money online, it is that you are up against the world. There is no reason for anyone to find success online if they aren’t willing to put in the time, work, and effort. The opportunities are there for those who are willing to fight for them. Now show the world of freelance what you have to offer! As online content creators and freelancers, it’s a necessity to not only ‘be on social media‘, but also to take advantage of it in as many ways as possible. It’s also not just about building a following, but also knowing how to use it in the right ways to help grow your following, build your brand, and also increase new client work and follow up orders. 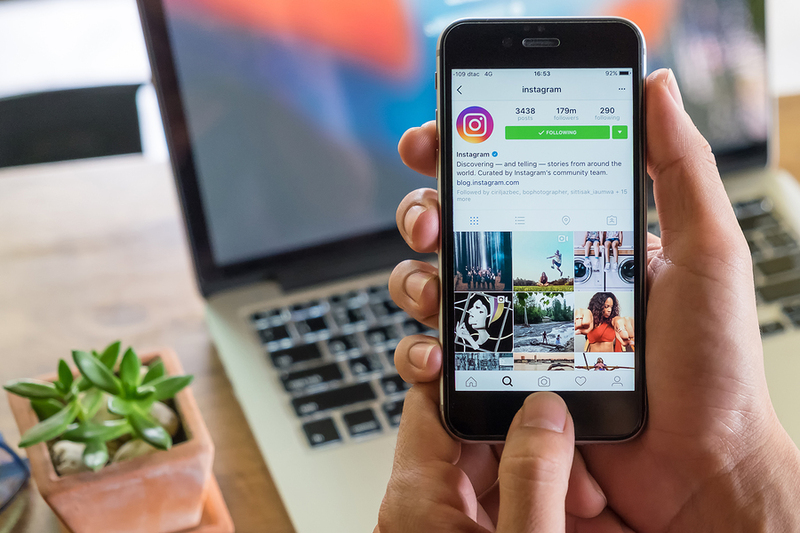 Facebook, LinkedIn, and Twitter are all great for this, but one of the most underused platforms being used by freelancers and content creators is Instagram. Did you know there are 1 billion Instagram users worldwide? 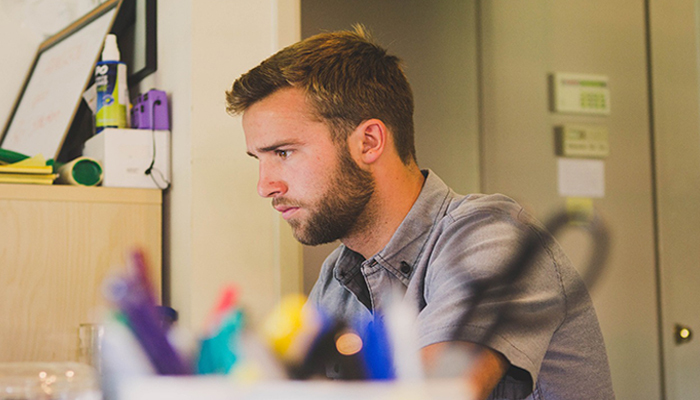 Want to build your freelance career but aren’t sure how? Not to worry! In this article, we’re going to cover some Instagram tips. This will help you and your freelance career. Instagram has many users all over the world and is more active than both Facebook and Twitter. This means that users on the site interact more with the content. You may think it’s for fashion and nature lovers, but for a freelancer, it’s a tool. Check out this guide of free tools for freelance writers as well. New followers check your profile. This is a spot where you can include links to your website and other marketing hubs. Make it easy for followers to find out more about you. Most users who have Instagram use their phones so make sure your website looks good on mobile. Try and write something more intriguing than a dry description of yourself. Write something that makes people curious about you and interests them. Take a look at any of the most popular users on Instagram and you will find that each of them have an excellent, profile image, bio write up, and a quality link back to their main site or call to action page. 2. What is Your Goal? Think about why you’re on Instagram. Do you want to increase traffic, promote your brand, or increase sales? The reason why you’re on Instagram will help you decide what content works for your profile. You can mix these strategies up as well. If a freelance is working with a brand that just wants to increase their follower count, this can easily be done through a wide range of methods. Some of the most popular are to set up scheduled postings throughout the month, using hashtags within their updates, or even to just buy social followers and shares from another solution or provider. Your followers will feel more engaged if they feel like your friend. Show them things you do on a regular basis via Instagram stories. Most people might not live where you do. Consider taking pictures of where you live. This content is easy to capture and interests your followers. You can view more ways to relate with your Instagram audience in the article at https://sproutsocial.com/insights/how-to-get-followers-on-instagram/. 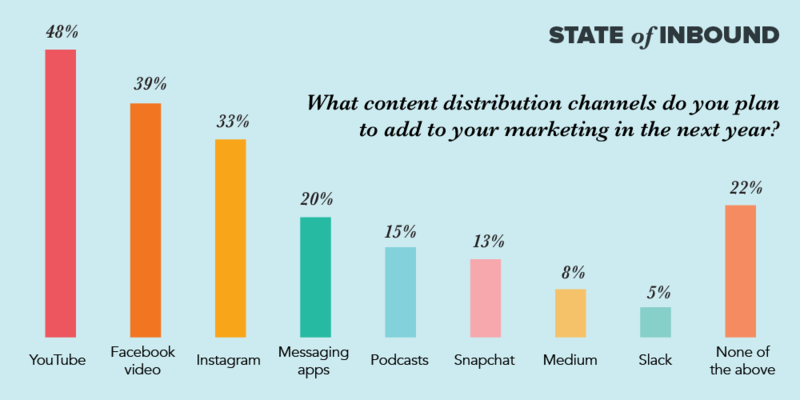 You can see many different resources in this article, such as why it’s so important to schedule out your content accordingly, and how to make sure it’s content your audience actually wants to see. If you want to increase traffic, post pictures that lead back to your site in some way. Post a bunch of unique content and put the rest on your Facebook page. If you tell people there’s more to check out on another platform, they’ll look it up. For brand awareness, you’re going to need to explain your message and values. What is your company about? How does it help people? Your followers will identify your brand and remember it. Increasing sales is another tactic. Post a coupon code where everyone gets five percent off the next article followers order. 5. When Should You Post? 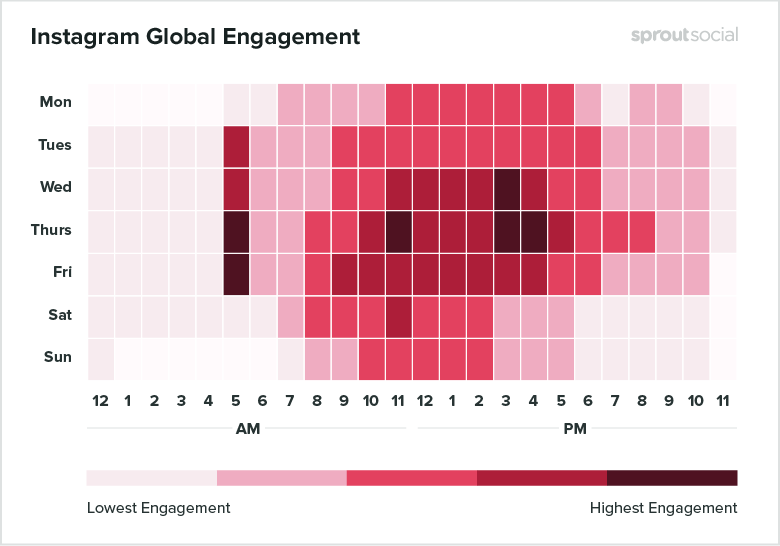 If you want followers to engage with your posts, consider the time of your post. The first wave hits when people wake up. People tend to check their phones in the morning. The second wave is around noon when your audience is taking a break from work. The final wave is in the evening when people have a chance to look through their content. This is the most critical wave. 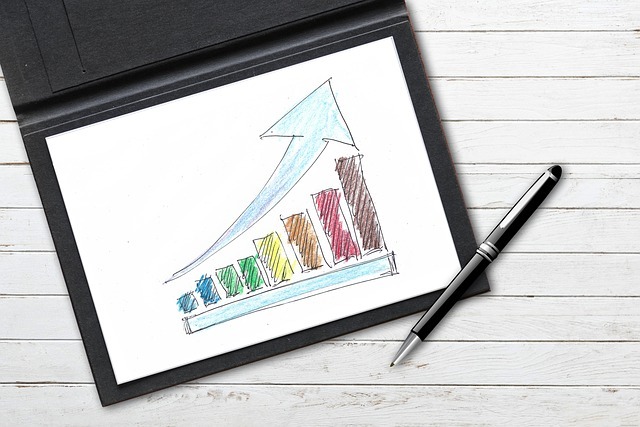 Learn more about how to improve your rankings on search engines in the article at https://www.microdinc.com/seo/. 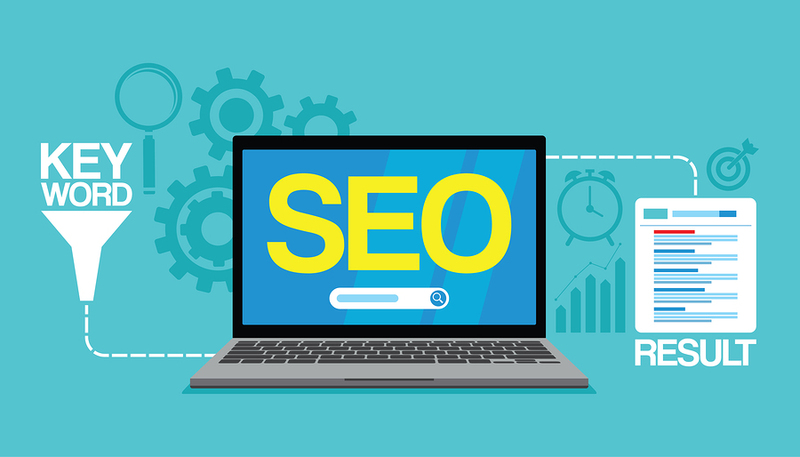 It covers the basics of using SEO for website optimization, keyword research, local search optimization and also how to analyze the competition. This is all very useful to any freelancers that are not only looking at how to create the best content to further brand themselves, but also how to cater to local businesses as well. Like it or not, social media plays a huge role in the freelance buying decision process daily. It’s also important to realize that freelance work isn’t just about writing text content. Cater to the needs of your clients. Let them know how important Instagram and social media is to their own business. And then offer them services and solutions to their problems. I hope you found these Instagram tips helpful as a freelancer. Instagram has a lot of users worldwide. As a freelancer, sharing content on Instagram will increase traffic to your website. Guest blogging is one of the most effective ways to not only reach new audiences and to potentially add new backlinks to you site, it’s also a great way to improve your existing writing skills. Best of all, it’s a working method for freelance writers, bloggers, and brands of all sizes. When you look at the average internet user today, it’s hard to know what you are going to get. They will likely come to your site for it’s content, but they will likely only read a little bit of it. Forty-three percent of people say that they skim blog posts. If you’re going to go to the time and effort of writing guest posts, you want people to read them! Read on to learn how to write a guest post blog that people will actually read (and that will be accepted by the site’s editors). The most important rule for writing a guest blog post is to carefully read and follow the guidelines the editor sent you. Especially if you are writing for one of the many websites that pay writers, it’s important to keep the guidelines straight. The world’s best-written blog post can be rejected for failing to stick to the link limit or including an image from an unacceptable source. The guidelines usually cover everything you need to know about tone, style, and word count. It may also tell you how many words you can use for your author bio and rules about your headshot. If the guidelines are unclear, go ahead and reach out for clarification. What good is a blog post if no one can find it? Use Google’s best practices to ensure that your blog post comes up in the first few results of an internet search. A good structure for your blog post means that you use short paragraphs. Aim for three sentences or less per paragraph. Use the right header tags for your headlines. Except for the title, do not use H1 header tags. Your main headings should be H2 and any headings within that section will use H3 and so on. This will make it easier for people to read your blog post and it is also the way Google likes it. So it’s a win-win. When you have a list, use bullet points to make the list succinct and clear. And make sure to number your recipe steps or instructions so it’s easy to follow. Using this format will save your editor time and help you organize your ideas in the best way possible. People click on a search engine result only if they like the headline. Take time to brainstorm the perfect title. Write out three to five and choose the best one. Don’t just go with the first one you come up with. If your headline is catchy, engaging, and clearly articulates what a reader can expect to learn on that post, you’re headed in the right direction. Quotes, statistics, and questions often make for the best blog post titles. What about when they click and open up your post? The first thing readers are drawn to is the headers. Give those skimmers a reason to read the section under the heading by crafting a descriptive and interesting title. Hooray. Someone read your guest blog post to the end, now what? Include a call to action at the end of your post. What do you want them to do next? Subscribe to a newsletter? Comment with their thoughts? Give the readers specific instructions and they are more likely to do it. Looking to reach a wider audience? Read more details about the specifics of guest post outreach. Thanks for reading! We hope this quick tutorial on guest posts has given you the confidence to get your words out there. The unfortunate thing is that most people will simply read through this post and think about how everything mentioned was a great idea, but few will actually move forward. With so many people complaining about competition online, how they have no money to invest in their business, or that they aren’t seeing any SEO or traffic to their sites… it all comes down the time, work, and effort you put in. 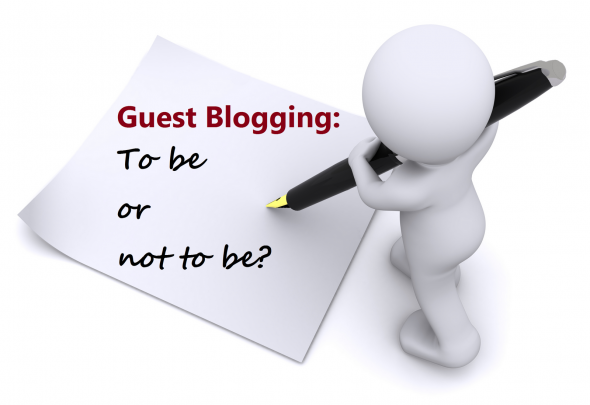 Guest blogging is free. It works, and it’s going to be working for a while now. Think you’re ready to write for a site like FreelanceWritingGigs? Check out their guidelines and fill out this form to get started. When you’re a freelance writer, you need to make the leap from starving artist to gainfully employed. There are countless ways to build your freelance writing income so that you can not only pay your bills but thrive. This is something I’m quite familiar with, as I’ve built up my own internet marketing from scratch and now have a flourishing business today. This is quite similar to the path of a freelance writer in that it will be tough in the beginning, but if you are willing to put in the time, work and effort — you can end up with something pretty amazing a few months or years down the road. With more than a billion active sites on the internet today, there are opportunities available but you also need to become savvier. Every website and blogs need to have new content, and if they aren’t creating it themselves, they are using freelance writers or premium content platforms to get the job done. This also means that there are millions of dollars being spent and paid out to those who can provide quality writing services. To this end, read on so that you can become a better freelance writer, and allow your earnings to reflect that. Having your own blog is great for a few different reasons. For one, it’s a great way for you to get better at writing by penning entries a few times per week. This keeps your skills sharp so that you can keep providing for your customers. It will also act as a portfolio so that you’re able to show the public what you’re capable of. Since they’re able to stop by your blog and check out your posts, it acts as a calling card for your brand. Today, people are building blogs that pay, and this gives even more leverage to sell products, ad space or guest posts. Of course, owning a blog is also great for search engine optimization, making your brand more recognizable and easy to find. This opens you up to more freelance writing income and helps you find gigs that pay well. Your first thought might be to get paid by the hour or per project. However, with Amazon and other outlets, you can write ebooks that sell like hotcakes and pay you every month. The same is true for other freelance writing platforms like iWriter, TextBroker and FreelanceMyWay. 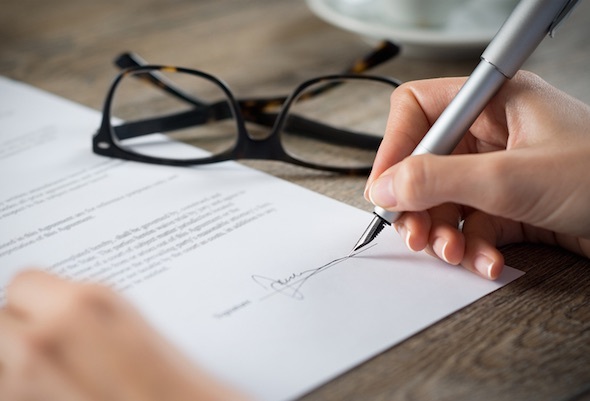 While each of these is great to picking up new writing jobs, it’s also important for freelance writers to communicate with whoever might be buying content writing from them as well. This back and forth engagement can dramatically increase the likelihood of more articles to be ordered, while also building a long-term relationship as well. It’s not just about engagement, it’s also about making sure your client is happy and that they are getting their money worth. Whether you’re writing about topics that you are passionate about or ghostwriting content for other people, you’ll be in a great position to expand your income by leaps and bounds. You’re already a great writer, now it’s time to start thinking like a businessperson. Many writers undercut themselves and end up robbing themselves of valuable income. Instead of setting your rates to get quick gigs that pay the bills, have the patience to only work with clients that pay you what you are worth. Check the going rate for freelance writing gigs so that you can set your rates and build a nice client base. This way, you won’t have to do as much work to get the same rate. Also, be sure to start with a higher premium rate so that you can also go lower if the client would like a discount with any bulk orders. This is something I always look for when working with a premium writer that continually produces great content. No matter what, you have to keep getting better at your craft. This way, you’re better able to bring in new clients and keep those that you have. This can be as simple as creating a website or blog to show off your best work, history within the industry, and also any certification or rewards that you might have received. Testimonials from previous paying clients can also go a long way as well. Travel to networking seminars and do all that you can to build your credentials, and the work will begin taking care of itself. Finally, do all you can to build your brand and connect with the public. People need to be able to find you whenever they’re looking for a credible writer. At the same time, it’s a huge benefit for your pricing and value to clients if you have a good understanding of how SEO and social media works. Being able to throw in some extra SEO research, on-site and off-site SEO tips, and social media shares within your content writing services is also a great bonus. You can learn more about this by reading through this link building and social media strategy guide. As you can imagine, with so much competition in the world of content writing and freelance services, if you can offer any type of bonus material or promotion in reference to SEO, social media, and improved branding for your clients, that could really seal the deal when being compared with other freelancers bidding on the same work. While all of this is happening, you can also build your band through photos and videos and learning more about marketing. Build your presence on social media as well so that you are always connecting with customers. When you run a business on the internet, there are many way to further optimize and scale your business. The same holds true for anyone looking to make money with freelance writing services. Following these tips helps you build your freelance writing income by leaps and bounds. You are now on a neverending journey of learning and becoming the best professional you can be. To get the most out of your career, keep learning the tips that will help you out. 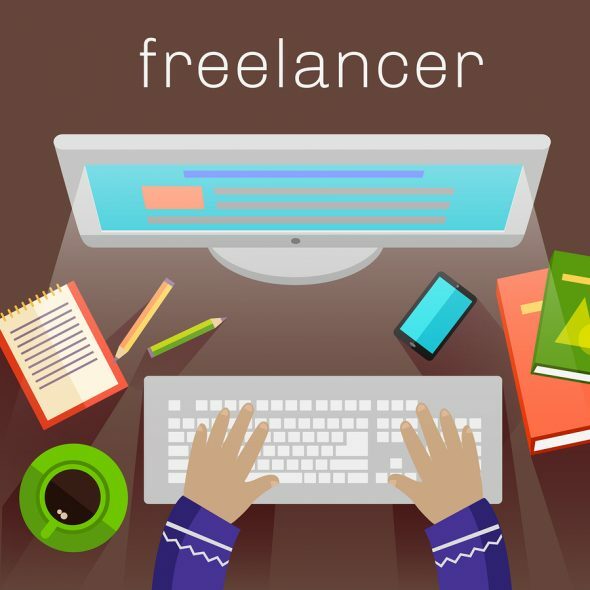 Be sure to check out my other articles on Freelance Writing Gigs to learn more about how to make more money as a freelancer, while also branding yourself as a premium writer and expert in the process. You love your day job, but you sometimes wish that it paid more. You’re in the process of saving up a little extra cash to go on a dream vacation, plan your wedding, or even finally make it out of debt. So, what’s the perfect side gig? Taking on high paying freelance writing jobs is a great opportunity for anyone willing to put in the time, work and effort. But how do you make it happen, and how can you improve your writing skills when it comes to commercial writing. In this post, we’ll tell you all about how to find writing jobs that aren’t only fun, but lucrative. Read on to learn how to find out about opportunities before anyone else does, and how to establish your own web presence as a writer for hire. We’ll even tell you how to write the perfect pitch, which often comes down to finding the right idea and purpose for your content, coming up with a reporting plan to document it all, and also knowing how much time to spend on the project. Once you have a better understanding of how to focus your time and effort, and also where to look for new writing jobs, you may soon find that the world of freelance writing is a lot more lucrative than you originally thought. 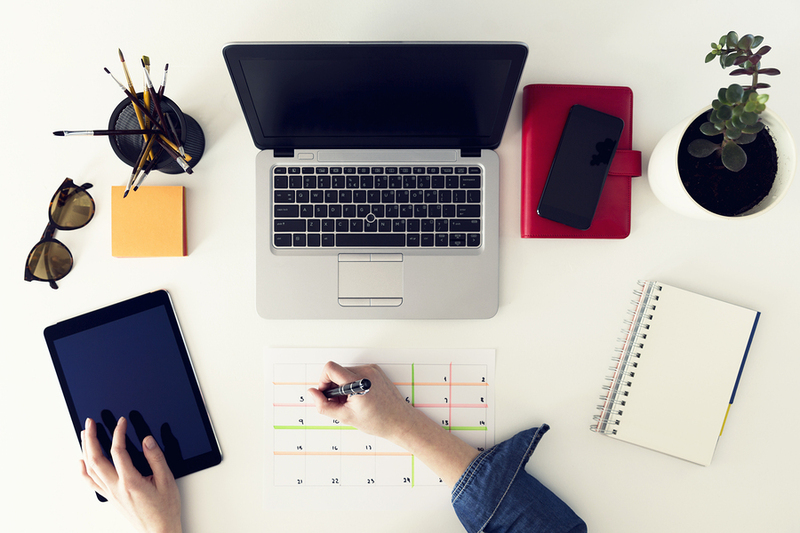 If you’re looking for freelance writing jobs, social media is one of the best places to begin. Make a list of magazines, blogs, online journals, and even businesses that you love. Also, do a search on social media for accounts related to the writing lifestyle, freelancing, and even commercial writing. You might be surprised by just how many people post about high paying writing jobs — before these opportunities hit the rest of the market. 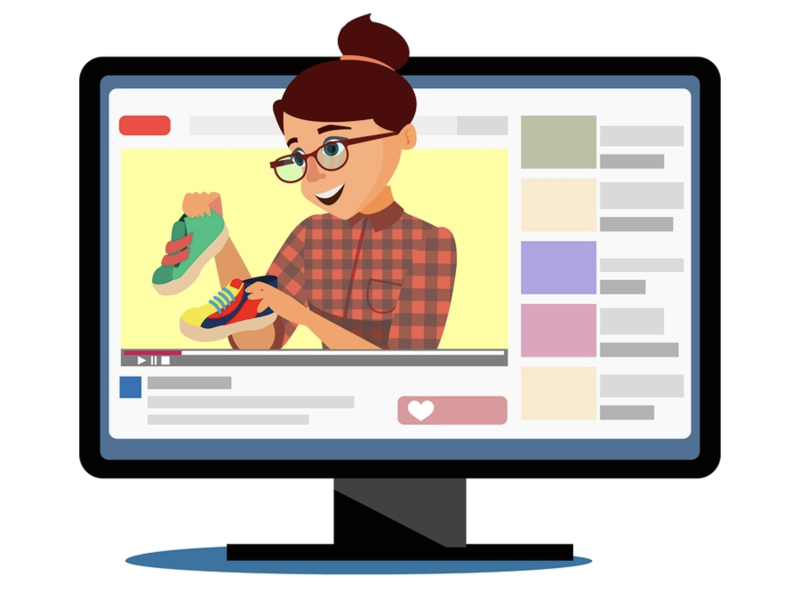 At the same time, also don’t discount the power of knowing how different websites, brands, and companies are putting their content to work for them on social media. Take a look at any effective social media strategy, and you will find that it starts with content. Once you start to notice what brands are continually pushing out new content, you may want to approach them directly to see if they are looking for new writers to add to their outsource team. The great thing about working with big brands that need a lot of content is that they are likely to keep ordering more written work from you for the next several weeks, months, and even years to come. Especially if you’re ready to get into freelance writing for beginners, you’ll need to work to establish your web presence. Companies are always looking for bloggers — and you want to make sure you show up in their search results. You also want to establish yourself as an experienced professional in the commercial writing world. Start by including clips to your past published pieces — beginning with the most recently published first. Include your CV with information about your education, any scholarships or fellowships you’ve received, and other accomplishments within the writing world. Don’t forget to set up a blog on your website dedicated to showing off your writing. You can also see an example below of how an author bio with a real photo and detailed description can bring your content to life, while also putting a real face and person behind the writing. Make sure that you include a brief author bio and headshot on your website so that people can get to know the person behind the words you’re writing. For tips on what to include in (and what to leave out of!) your author bio, check out this post. You can see a preview of each of their ten recommended tips below for improving your reach, authority, and success as an online freelance writing or author. You will need up to three versions of your bio. Leave your demographics for the end and keep it brief. When listing book publications, should you have any, italicize the title and do not put in quotation marks. The credibility an award gives a book can change the life of it! BS? BA? BIS? MBA? Ph.D.? Your bio will change dramatically as your career advances. If you can, have a professional (or at least a really good) photographer take a quality author photo of you. Browse the Internet and look in the books on your bookshelves for ideas. Also, include links to your social media profiles — in short, give companies that want to hire you to write for them as many ways to contact you as possible. Knowing where to find writing jobs online is the bread and butter of a successful freelance career or even side hustle. When you’re just starting out, companies aren’t exactly going to be approaching you with writing opportunities (but hopefully they will in the future!) Luckily for you, there are several well-known and reputable writing job boards that you can scroll through. 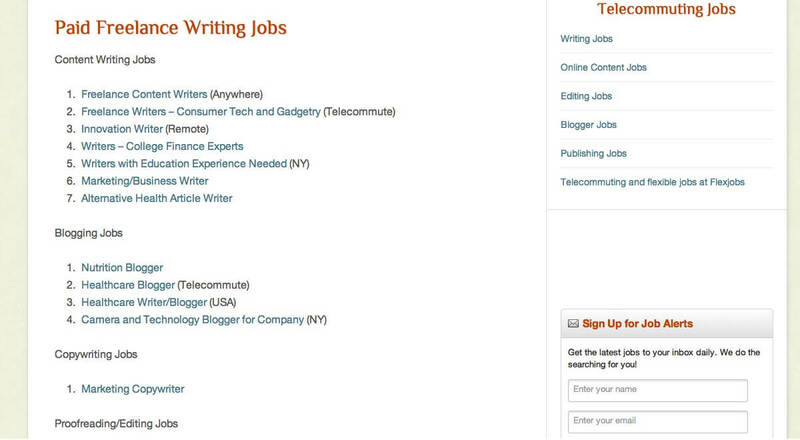 In addition to the awesome job board on Freelance Writing Gigs, you will also come across other great ones at ProBlogger Job Board, Dice, MediaBistro and Craigslist. This makes it much easier for you to find the types of writing gigs that are the best fit for your skill set. Many of these job boards also have an email list. Make sure that you sign up for it so that you’ll get alerts the moment a potential job posting goes up. Writing job boards will break down the opportunities by category, so it’s easy to find what you’re interested in. For example, you can choose from copywriting jobs, editing jobs, blogging jobs, and even broader content writing gigs. While some of these opportunities will be a “one and done” situation? In other cases, you’ll be able to build lasting relationships with these clients. That’s an awesome way to build up your client book for the future! So, you’ve followed all of the above tips on how to find writing jobs — but you’re just not getting any results. In addition to feeling the pain of rejection, you’re also concerned that all of your writing efforts might be in vain. However, just like any profession or opportunity in the world today, it all comes down to those who are willing to put in more work and stand above the crowd. 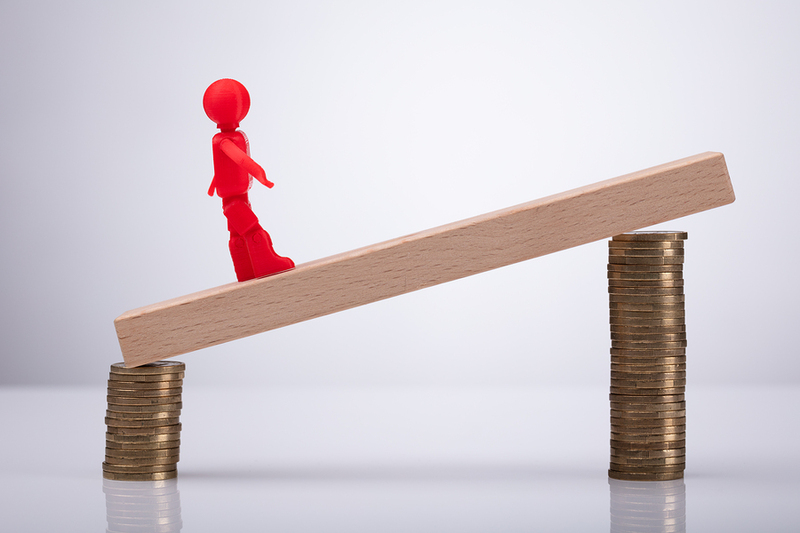 A perfect example of how to best accomplish this can be seen in finance writing articles. Let’s specifically take a look at the loans with bad credit article and how it breaks down different data points throughout the article. 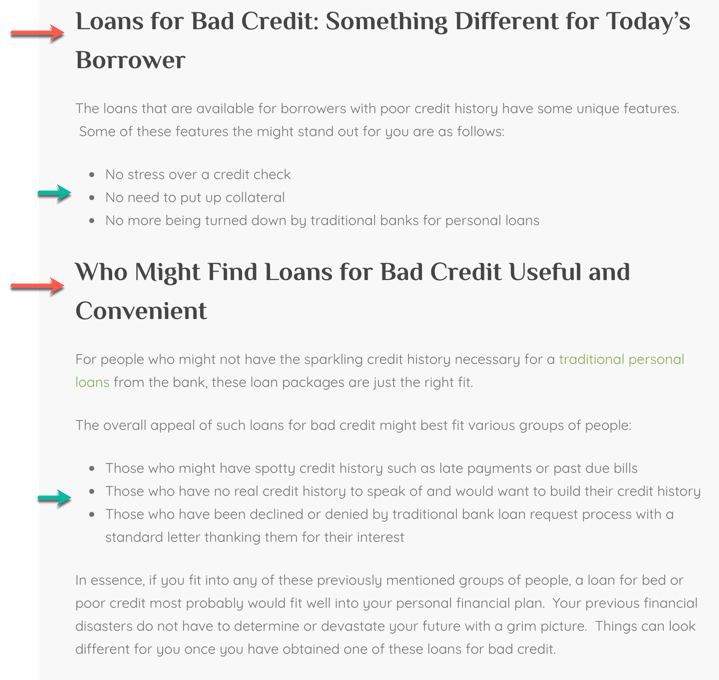 With the title being “Loans for Bad Credit”, it’s important to actually provide the end user with value, and not just a lot of written text in large paragraphs. We can see this article is actually very well written and laid out nicely as it has bold headlines (the red arrows) through the content, while also further breaking down each point into sub-paragraphs and will bullet points (the green arrows). This is not brain surgery here, but it makes the world of a difference to the end user, the site owner, and the freelance writer. Way too many freelance writers just want to create 500 or 1000 word articles and move onto the next job. This is great for them, but not so much for the end user and brand publishing the content. To see more examples like these, be sure to read through some of the top personal websites you want to write for, and see if their content is laid out in this same way. This will allow you to get to know their overall writing style better, and understand the kinds of topics they’re interested in publishing. And again, put in the time to not only write the best content possible but to also provide the right outreach and opportunity for each site as well. Send out a cold pitch email to a bunch of sites, but make sure they are somewhat personalized and offer real value. Explain the article you’d like to write for them, and discuss why you’re qualified to write it. Include a potential length, as well as the date you’ll provide the first draft for them to edit. Make sure you include your contact information and a short “author bio” so they can get to know your work. Above all, don’t forget to include the amount that you’re looking to be paid for this gig. If you don’t bring up payment in your first pitch email, many blogs will try to get you to work for free. Aim higher than you’re OK with making. This will give the company a bit of room for negotiating with you. We hope this post has helped you to understand how to find writing jobs that connect with your interests, skill set, and your creative side. As long as you’re willing to stay persistent and to follow up with leads, you’ll be able to build a nice client book in no time. Looking for the latest writing gigs in blogging, content writing, and even editing? Want to get more advice about how to live the writing lifestyle to the fullest? As mentioned earlier, if you are still looking for freelance work, be sure to check out the FreelanceWritingGigs job board to see which opportunities might e right for you. Be sure to bookmark this blog for more tips on how to make life as a writer work for you. You likely already have a massive library of well-written, well-researched blog posts, yet your audience numbers seem to have stagnated and you’re starting to see an effect on your site’s search ranking. Now, you second guess every post you publish. Will people even read it?